Issues like lack of core support, pelvic instability, muscular imbalances, poor posture, and lack of body awareness all affect back health. One or many of these may be causing your back to hurt. An optimal combination of rest and exercise is what will help your back to recover and relieve you from pain. Exercise can be thought of as any other health prescription: A qualified physiotherapist, an expert in muscle and movement - will customize exercise and prescribe you a set of exercises and help you progress gradually into recovery. Does Physiotherapy exercise work for back pain? A single session of an exercise such as walking can reduce low back pain 10 to 50 percent, reports a 2004 study in The Spine Journal showed. Walking is a very effective weight-bearing exercise known to be working the whole body and not just the back. Regularly performing weight-bearing exercise (exercise that works against gravity) has been shown to help maintain and build up bone mass too. However, if walking gives you shooting leg pain or numbness, stop and see a doctor. What exercises are good for back pain? 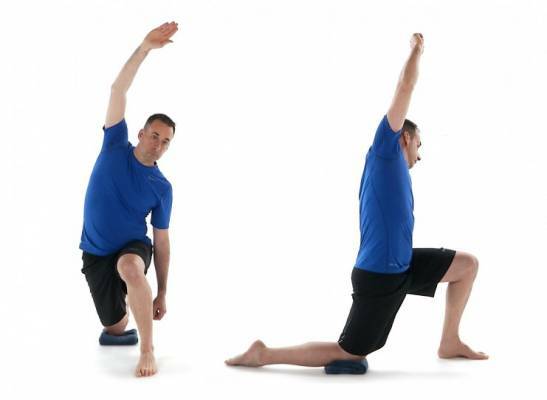 The exercises below can be used as a guide to relieving non-specific LBP or Lower back pain (i.e. not as a result of an acute injury or condition), and are recommended to be done daily to most effectively treat and prevent LBP. If you've ever hurt your back or have other health conditions, such as osteoporosis, consult your doctor before doing these exercises. 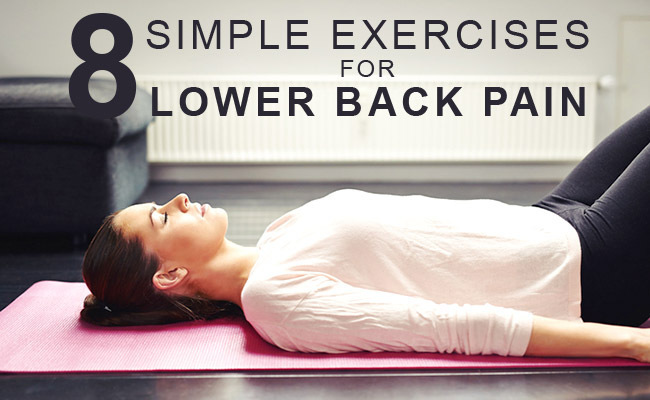 Some exercises can aggravate back pain and should be avoided when you have acute low back pain. It is best to discontinue an exercise if it causes you inconvenience or pain and seek advice of a physiotherapist. Lay on your back in Neutral Spine (relaxed back muscles and natural curves), knees bent and feet flat on the floor. Breathe out and gently engage and “lift” pelvic floor muscles (those that stop you from urinating), then pull the navel in toward the spine so that the lower back “imprinted” into the floor. Breathe in and relax the muscles and return to Neutral Spine. This is a Core and abdominal strengthening exercise. Lay on your back in Neutral spine, knees bent, feet flat on the floor and hands behind the head. Pelvic floor and other core muscles engaged. Breathe in to lay the head back down. Lay on your back, knees bent, feet flat on the floor and arms stretched out to the sides. Keep knees squeezed together (you may want to use a towel to help), slowly take the knees over to one side, keeping shoulder blades in contact with the floor. Breathe out pulling your navel into your spine and drag the knees back to the centre. There is a strong correlation between LBP and tight hamstrings. Stretching these muscles helps to immediately relief tension in the back and continued stretching over time will help improve the posture in the lower back. Keeping leg straight, pull the leg towards you as much as possible without twisting, until you feel a stretch. Keep breath flowing and try to relax. You should feel a stretch in the back of the thigh. Kneel on ground with one leg forward (foot flat on the ground). Lift tall in the spine and keep the navel pulling in, then tuck the pelvis under (opposite to poking your bottom out). You may start to feel a stretch in the front of the hip. Bring weight forward onto front leg if more stretch is required. Sit tall with the legs bent comfortably out in front and feet on the floor. Hands placed on the back of the thighs. Breathe out and begin curving the spine starting from the tailbone, rolling backwards until arms are straight and the whole spine is curved in a C-shape. You should feel as though the navel is the furthest point pulling backwards. Hold there and breathe in. Breathe out and bring the body forward, keeping the C-curve, until shoulders are over the hips, then stack the spine up to a straight, tall position. Repeat 6-10 times. Kneel on all fours, ensuring the hands are under the shoulders, the knees are under the hips, and the spine is in neutral. Without moving the torso at all, reach one arm forward and the opposite leg back keeping the finger tips and toes on the ground. Lift the extended arm and leg off the ground, keeping the navel pulled in to help stabilize the torso. Hold for a few second before bringing the hand and leg back down and to the start position. If you’ve had to readjust, you will know if you have moved the torso during the exercise. Try to correct this with each repetition. Repeat 3-5 times each side. Once you have successfully completed the above set of exercises for a period of 2-3 weeks, you may now progress to doing planks. Form and correct position is of critical importance for doing a plank pose. Ask someone to supervise you or learn the pose from a physiotherapist. 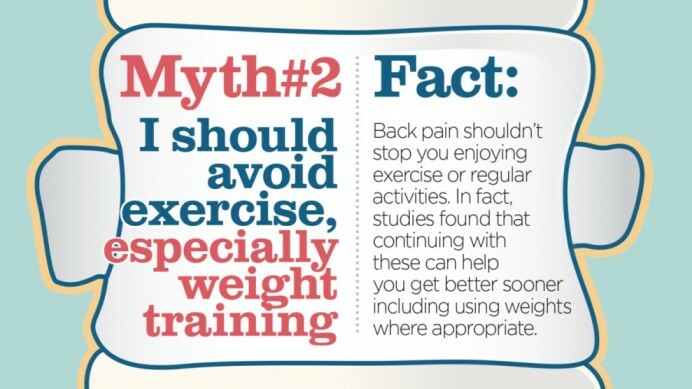 Back pain has many causes and certain forms of exercise may not be right for all of them. If you have back pain, especially serious or chronic back pain, please check with your health care practitioner before you begin any exercises. It is important to work with a qualified physiotherapist who is aware of exactly what challenges you are working with. You can call ReLiva at 9920991584 and we will connect you to a Physiotherapist near you at our clinic or at your home. How does exercise work for back pain? We usually think of our alignment as our posture, but good posture is a dynamic process, dependent on the body's ability to align its parts to respond to varying demands effectively. When alignment is off, uneven stresses on the skeleton, especially the spine, are the result. Physiotherapy exercises, done with attention to alignment, create uniform muscle use and development, allowing movement to flow through the body in a natural way. Good posture that goes beyond the "look" of being aligned requires core strength. Having core strength means that all of the muscles of the trunk of your body are strong, flexible, and working together to support and stabilize the spine. Your physiotherapist will design an exercise program that trains the body so that all of the core muscles work together to support and stabilize the back. A healthy spine can curve forward and backward, twist, and move side to side, and do so in a way that reveals all the subtle articulations that our many vertebrae allow us to have. As core strength develops, the back muscles learn to work in harmony with the abdominal muscles, forming protective support for the spine that increases the potential range of motion of the spine. ReLiva physiotherapist will modify the exercises so that you can develop spinal flexibility at your own pace. This is one of the things about Physiotherapy that makes it easy for people with back pain to work with. Whether the cause of pain is from an injury or as is often the case, a culmination of the effects of poor posture and inefficient movement habits, back pain is a messenger letting us know that we have to pay more attention to how we live in our bodies. Once you start paying attention and care for your body muscles, you will learn to be aware and respond to the signals your body is sending you, thereby avoiding injury and harm in future. Contributed by Dr Pooja Sapte (PT). Dr Pooja is a qualified physiotherapist and has experience with diverse musculo-skeletal issues and sports injuries.